Crackers and dips are my current favorite convenience food. The convenience comes from the fact that I can make a big batch in advance (both crackers and dip) and then have it as I feel hungry (usually for lunch) or as a snack in the afternoon over several days. The whole cracker/dip passion was started by my son who demands crackers, carrots and chickpea hummus in his lunchbox. I have been experimenting with different flour/seed combinations in my crackers, and I always have an open mind for new dips. I was immediately intrigued when I first heard of a raw green pea hummus. I have always liked the raw factor in foods. Not only because vitamins and minerals are staying intact, but also because it results in very few dirty dishes. Usually one bowl to mix ingredients, and that's it. While I was a little in doubt if a raw pea hummus would be just a tad to sweet, the combination of sweet peas with basil sounded truly promising to me. The ingredients list is incredibly easy, and basil is growing like weed in my garden. In fact, my basil plants have become bushes. So off I went to dirty my one bowl. The resulting dip would have been worth many more dirty dishes, I promise. 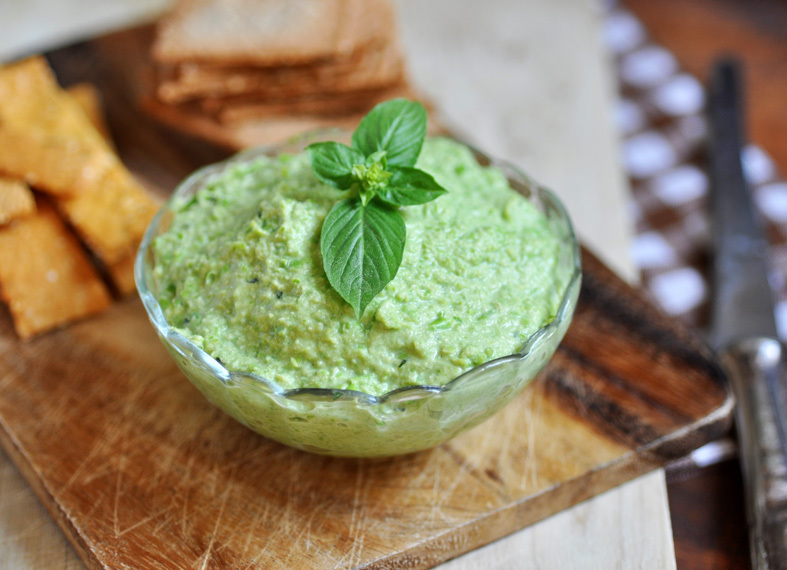 This pea basil dip is so refreshing, healthy, light. A welcome dip change for every now and then, for someone like me who has been living off chickpea hummus for several years. Place all ingredients in the bowl of a food processor and process until smooth. Add water to achieve desired consistency. Serve immediately or store in the fridge for up to 48 hours.